A backhanded strike came swiftly and quite unexpectedly, spinning Sarkan to his knees. The heavy rings that adorned the acolyteâ€™s hand adequately amplified his displeasure, leaving a trail of broken skin from cheekbone to jaw. Sarkan could have argued that the scroll was handed to him by another acolyte from the encampment and the error was not his own, but he knew this would only invite further lashing. To the west, an indifferent sun was crawling down the back of a nearby obelisk, daring Sarkan to an impossible race. Thunder rumbled from darkening skies to the south, accompanied by a shift in the winds as a storm front threatened to overtake the worksite. Without a word he began the long trek back towards the encampment, the scroll held before him in outstretched arms so as to make as little contact with his impure body as possible. It was now approaching the third month since he was pulled from his assigned fields outside Khemi to work at the excavation site, and the disdain of the Priests was as infinite as the sands. From farmer to errand boy at the whim of the Priesthood, Sarkan reflected. As he made his way past a line of emaciated slaves working to remove the shifting soil from yet another megalith, he decided his position could be worse. Supposedly the scattered stalks of stone they labored to uncover belonged to some long abandoned temple. At least that was the impression Sarkan had from the whisperings of the hated priests as he awaited their demands at various locations throughout the site. He cared nothing for dusty ruins or priestly needs. His concerns centered on the condition of his crops and fears that he would still be held accountable for his quota despite being relegated to this endeavor by the Priesthood. Scratching, clawing and sniffing like so many plague-ridden rats for some stray morsel and none of them worthy of the crumbs which they sought. None of them able to conceive of the recombinant power which lay within the brilliant arcane design serving the duality of both prison and womb. The selection would be critical. One with practiced knowledge would be far too cautious. One with too much greed would be too quick to seek profit. One with too much arrogance would seek too much control, and one with too few wits would succumb to inaction or fear. And one without need would be far too stubborn. The endowment of perfect balance existed within no human, but the selection was made. Sarkan was halfway back to the encampment when a sudden gust of wind tossed the scroll from his hands towards an alcove of exposed ruin cleared weeks earlier. Terrified, Sarkan glanced all around expecting to find imminent execution racing towards him in the form of an Acolyte enraged at his blasphemy. Relieved and thanking Set that the work crews had already completed excavating this section and moved on, Sarkan gave chase as the scroll bounded along the ground and came to rest among the ruins. Stooping to retrieve the troublesome scroll, his sandaled-foot disturbed a fist sized stone. The grating of rock on metal was distinct. Recovering the scroll and ensuring no one was watching, Sarkan tossed the stone aside and swept at the soil. He was rewarded with the glimmer of silver. Intrigued, he knelt down and began to dig further. As his fingers touched the gleaming metal, an unseen impulse of energy traveled up his arm. Sarkan fell back and shuffled away from the treasure, raising a cloud of dust. The disembodied feminine voice laughed softly, and continued in a calm, refined manner. There was no threat in the words, only a declaration of fact. â€œWhoâ€¦ what are you?â€ Sarkan asked softly, his voice trembling as he glanced around in fear that someone would hear and come to investigate. Sarkan stood and backed away hesitantly as he inspected his arm. He was aware, of course, that mystical trinkets and oddities of the arcane existed, but he had never encountered them personally in his fields. And he was quite content to maintain his ignorance of such matters, Stygian or not. He pondered the voice, racing through the dunes as quickly as the ridiculous ceremonial posture would allow, but keeping a firm grip on the scroll. The perception of light had been forgotten, and the brilliance and intensity relayed through renewed sight by way of contact with the peasant was overwhelming after centuries of contained darkness. Now able to perceive the environment immediately surrounding her chosen disciple, she studied her selection with a critical eye. He was reasonably young and endowed with the fit physique of one who labored with the land. His mind, however, was not a reflection of the body. It would require careful molding and focused discipline to become useful, but such was the ideal state for the first chosen. When Sarkan finally arrived at the encampment, the scroll-keeper seemed in no hurry to locate the correct text, and had strolled leisurely behind the canvas partition to the back section of the tent. To Sarkanâ€™s right there was a table filled with freshly-cleaned artifacts awaiting the nightly inspection by the priests. â€œYou mean from one master to another,â€ he muttered, shaking his head in disbelief at the atrocity he was about to commit. Taking a few tentative steps towards the table at first, he briskly strode over, grabbed the pendant and secured it inside his tattered pants. [i]Oh glorious[/i], the voice offered sarcastically. â€œWhere else would you have me hide it?â€ Sarkan whispered, making his escape away from the table just as the scroll-keeper returned through the partition. Sarkan accepted the scroll with the appropriate bow and assumed his reverent posture, leaving for the dig site with much haste. The approaching storm chased the last vestiges of the sun beneath the horizon as Sarkan presented the scroll to Acolyte Hinsh. â€œI should set you afire so as to have light sufficient to read the guidance of the Tolna, you worthless wretch,â€ Hinsh threatened without looking up from the ancient text. â€œMy apologies, esteemed Acolyte. The keeper required some time to locate the proper document,â€ Sarkan repented, kneeling before the acolyte. As he rose, something struck him hard in the head from behind and he felt the warm sand on his face as the world began to loose focus. Some moments later he came to the realization he was being dragged by his arms along the path to the encampment, no doubt destined for the sacrifice holding cages. As he did so, he felt a fierce whirlwind of sand begin to swirl around him. The two overseers stopped dragging him and released his wrists as they attempted to shield their eyes. Sarkan opened his eyes and saw he was just outside the alcove where he had made his discovery. The dust-covered brutes were stumbling around working to clear their eyes of debris even as the whirlwind continued around them. 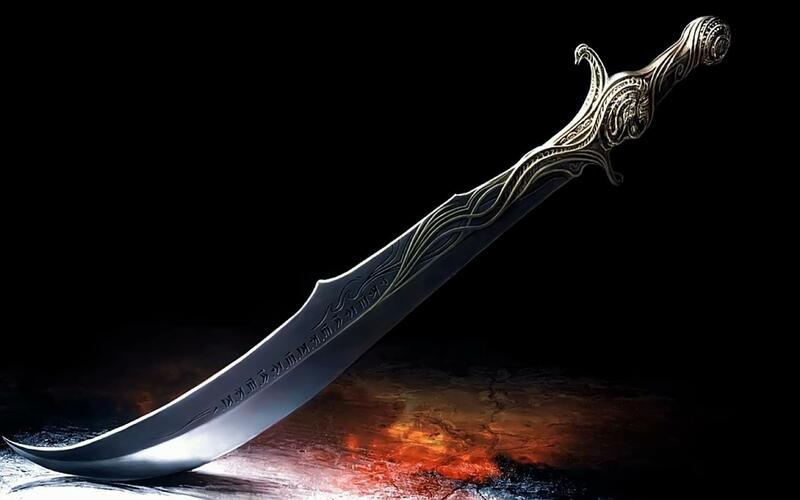 Sarkan grabbed at one of the daggers secured at their side, but hesitated as he wielded it before him. Gripping the blade tightly, Sarkan slashed at the throat of the closest guard. The brute attempted to scream, but could only succeed in a horrible gurgling as blood covered his bare chest. As the wounded guard fell writhing to the ground, the second became entangled in his legs and fell. Sarkan reversed his grip on the blade, looking away as he jabbed it towards his victimâ€™s neck. All motion ceased as the steel pierced the throat up to the hilt and severed the spine. Sarkan cleared the soil around the artifact as the voice spoke to him. The silver disc was flat with angled sections removed symmetrically from the quadrants. The crimson runes etched into the surface appeared to glow softly in the fading light. â€œIf the power you speak of is intended for such deeds, I want no part of it,â€ he said, gesturing to the unmoving bodies in the path. Sarkan carried the artifact through the excavated ruins, heading north towards the river. The last of the work crews from the northern site passed by, but to the south a shout of alarm went up as the guardâ€™s bodies were discovered. Sarkan bolted through the remaining ruins, placing as much distance as he could between himself and the encampment. â€œAnd who are you to offer me such promises,â€ he asked between breaths.